Irrigation for a new vineyard in the Cuyama groundwater basin. Photo by Casey Walsh. Casey Walsh is an associate professor of anthropology at the University of California, Santa Barbara. His research focuses in part on ways water, land, and labor have been organized to produce commodities in arid areas. He wrote a socioeconomic and cultural history, Building the Borderlands, of irrigated cotton agriculture in northeastern Mexico. This the second part of a conversation with Dr. Walsh, the first interview focused on his book Virtuous Waters. He has also been increasingly involved in the politics of groundwater management in California, which I ask him about in the interview below. You're currently working on issues related to groundwater in California, particularly implementation of the new Sustainable Groundwater Management Act (SGMA). Can you tell us a little more about what you've been focused on? I have been following the SGMA process as it unfolds in both the Paso Robles and Cuyama groundwater basins in the Central Coast region of California. I am mostly an academic observer, but sometimes I do participate when I have something to contribute that is not already present. As an anthropologist, I'm particularly interested in the themes of access, power, and money. And how those things play out is fairly different in these different basins. Can you describe some of the differences that you are seeing? In Paso Robles there are numerous landowners of all sizes, many of them very well educated. As a result, there are many active citizens who are well-informed about the SGMA process and legislation, the local hydrology, and the many beneficial uses of groundwater. The process of groundwater management in Paso Robles has been very public for this reason, which I think is good, although it is slow and difficult. There, I don't have a lot to say that people don't already know. In Cuyama, on the other hand, there are very few residents in general and the whole process of groundwater use and management is dominated by a few enormous industrial farming companies. So there is not a robust population there to get involved in the SGMA process, and I think my perspective is needed more. For example, I have given public comments at meetings of the Santa Barbara County Board of Supervisors, and at informational meetings held as part of the public outreach for the Groundwater Sustainability Agency formation in Cuyama. I speak up when I don't hear anyone else saying things that need to be said, or when I sense that public participation in the SGMA process is not present, valued, or encouraged. 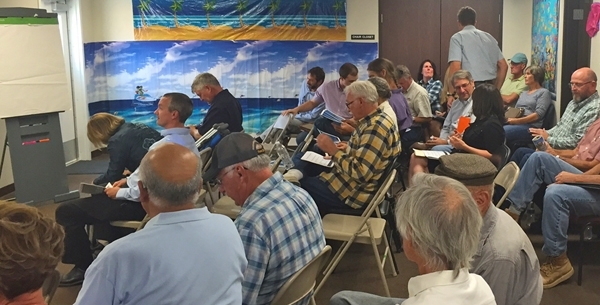 A groundwater meeting in the Cuyama groundwater basin. Photo by Casey Walsh. What has been most interesting to you about the SGMA process so far? As a novice to formal politics, I have been surprised that in the SGMA process, which began in 2015, county governments usually do not really seek out, and often actually try to limit, public participation in the political process of managing groundwater. The anthropological literature about sustainable water systems around the world shows us that generalized public knowledge about, and involvement with, water management is an absolute must for sustainability. However, in California it sometimes seems that some folks in government and business are trying to achieve sustainability with as little public participation as possible. In my experience so far, participation of most people in groundwater politics is limited to three-minute statements in public hearings, letters filed on webpages, and perhaps a brief audience with a sympathetic county supervisor. I get it that county administrators charged with the new SGMA workload are very busy and understandably not excited about having to explain things to folks who come knocking. But it then becomes difficult for most citizens to become engaged in the management of their groundwater because it is hard to learn about the law, about the hydrology, and about the way that counties administer the resource. This is not true in every groundwater basin or county, but in general the state needs a groundwater education program to get more people thinking about the resource as theirs, and as their responsibility. After all, SGMA asserts that California groundwater is a common-pool resource, but we are still a long way from managing it that way. 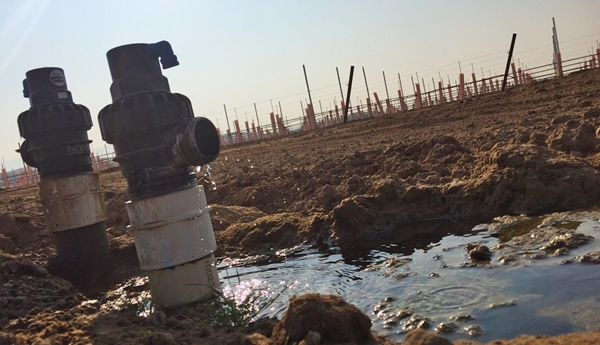 What is it like to be an anthropologist working on groundwater in California? Anthropological research takes many forms, but what it offers is the local perspective that very few other approaches can gather. Some anthropologists do very systematic research with survey questionnaires; I prefer just to get to know people and learn what I can about how things are working in a particular place. This focus on local knowledge can be confusing for some people, because the anthropologist might look like he or she is just hanging out, or worse yet, snooping around. A new vineyard in the Cuyama groundwater basin. Photo by Casey Walsh. When I just started the research, I visited a public meeting in Paso Robles convened by a local organizer. After the meeting we began to chat, and I gave her my research proposal for studying the relationship between wine production and groundwater depletion in the region. She told me right then that I had gotten it wrong; that the real problem was water banking and water markets. She asked me if I was one of the UC Santa Barbara folks interested in water markets. I assured her that I was not, and that I was really trying to understand how the process of water management was unfolding in Paso Robles. However, this local knowledge is delicate. The next time I contacted her she said that she wouldn't talk to me until she was sure why I was doing this research project. We haven't spoken since because I haven't mustered the courage to call her back. I felt bad that I didn't come across as trustworthy, but with some research under my belt I completely understand and respect her caution. Water is hugely important in California, and the SGMA stakes are really high. Fortunes will be made and lost depending on how the process of groundwater management unfolds. The role of the anthropologist is not to take sides in this, of course, but to show how it works. To protect the identities of the people I never write their real names in my notes and publications. The goal is not to report on people, but rather to understand the overall social and cultural dynamics of groundwater management. I do have some peripheral experience in groundwater management so to me SGMA will be an interesting "exercise".... long, long overdue in California... and of course in the background I continually hear Mark Twain's words of wisdom about California's water..."Whiskey is for drinking... water is for fighting"... or something like that.